For the Checker Cab-based taxi from previous GTA games, see Cabbie. A Cabby in GTA IV (Rear quarter view, with different accessories). 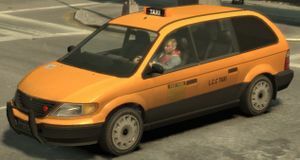 The Schyster Cabby is one of three yellow taxi models in Grand Theft Auto IV, based on the in-game non-commercial Vapid Minivan. Like the Minivan, the Cabby resembles a fourth generation Dodge Caravan or Chrysler Voyager; for comparison, most real-life New York City Taxi minivans use the Honda Odyssey most commonly, and also the Chevrolet Venture, Ford Freestar, and Toyota Sienna as their base (however Caravans and Voyagers are used seldom). However, with NYC Taxi, the Caravan and Voyager are still occasionally used. While the vehicle bears a Schyster badge, rather than that of Vapid, the rear of the vehicle reads on the left side Minivan Cabby, and on the right side Limited Vapid designed. The Cabby differs from the Minivan only in braking and suspension, as described below, and in its taxi fleet markings. There is some minor cosmetic variation among Cabbys, including a variety of roof-mounted taxi signs, and the presence or absence of stickers, scuff bars, and black trimming above the sideskirts. The Cabby also features a wheelchair accessibility lift on the rear bumper; however, it is non-functional in-game. Players can enter Cabby's and take taxi rides to destinations. The Cabby, based on the Minivan, retains the same 24V V6, 4 speed gearbox and RWD layout, leading to slow acceleration and a poor top speed of 145 km/h (90 mph). The suspension has been slightly upgraded to cope with Algonquin's rough roads, and, accordingly, the Cabby handles much better than the Minivan. The brakes have also had a slight upgrade, giving the Cabby a shorter stopping distance. ABS brakes are still standard. Accident deformation and engine build quality remain acceptable. The three default radio stations in the Cabby are Integrity 2.0, WKTT Radio and Public Liberty Radio. The Cabby shares a very similar rim design as the Vauxhall version of the Opel Corsa Mk5 & 6. However, this is probably a coincidence, as the Cabby bears no other similar features to the Corsa. Unlike the two other Taxi models in GTA IV, the Schyster Cabby is only seen driving throughout Algonquin and is rarely found in Broker, Dukes, Bohan, or Alderney. This page was last modified on 25 August 2013, at 14:05.